The NBA season kicked off last night with a much anticipated matchup of the Boston Celtics vs the Cleveland Cavaliers. What made the game so intriguing was watching what kind of reception former Cavaliers Kyrie Irving would get now that he’s playing for the Celtics. Soon after the game started however, everyone forgot about the rivalry. The Celtics Gordon Hayward suffered a devastating injury in the first five minutes of the game that left everyone stunned. Hayward went up for an alley-oop, and when he landed, you could hear the snap. 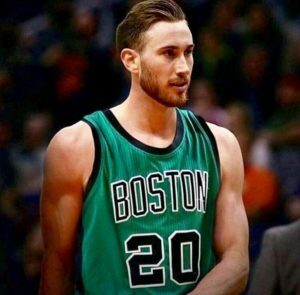 After the game, players and coaches weighed in with their prayers and good wishes for Hayward. Many reflected how it was one of the worst on-court injuries they’ve ever witnessed. Lebron said, “My thoughts and prayers go out to Gordon and his family. Those are the injuries that you never see coming, and you never want to happen, no matter who it is, no matter what the stature, no matter how much competitive nature you have. It’s just very unfortunate.” The Cavs beat the Celtics 102-99, but that seemed like an after-thought for the players who expressed their emotions over their friend and fellow playmaker. Dallas Cowboys running back Ezekiel Elliott held off suspension again when he got another preliminary injunction in his domestic abuse allegations. Elliott’s suspension is still pending, but in the meantime, he’ll be able to play against the San Francisco 49ers this weekend.